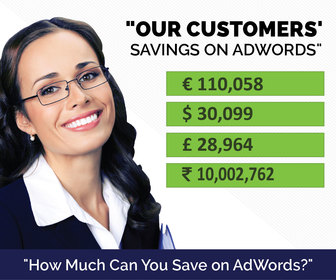 Posted 11:32 am by Kirti & filed under AdWords Tips, PPC Audit. With our Free Account Audit Report, for Google Ads and Bing Ads, advertisers can easily get insight into areas where their account’s performance can be improved. Posted 7:28 pm by Kirti & filed under Bing Ads, PPC Audit. As much creating and managing your PPC account important, so is auditing it to improve performance and review settings that might need to be changed. Here is a general list of options that you can revisit while conducting your Bing Ads account audit. Posted 1:58 pm by Kirti & filed under AdWords Tips, Keywords, Negative Keywords, PPC Audit. Posted 11:03 pm by Kirti & filed under AdWords Tips, PPC Audit. How To Outrank AdWords Competitors With Target Outranking Share? Posted 11:38 am by Kirti & filed under AdWords Tips, PPC Audit.